As I noted after the Service on Christmas Eve, my Brother Bill died earlier that day in Lindenhurst, Illinois. The snow storm of Sunday evening and Monday has kept me from flying immediately to Illinois. I hope to be able to fly out of NYC either Tuesday evening or Wednesday and conduct the funeral, with the assistance of my niece Rachel, on Thursday in Milwaukee where he will be buried. I expect to get a flight back to NYC and home on Friday evening. Thank you to all who have extended their condolences. 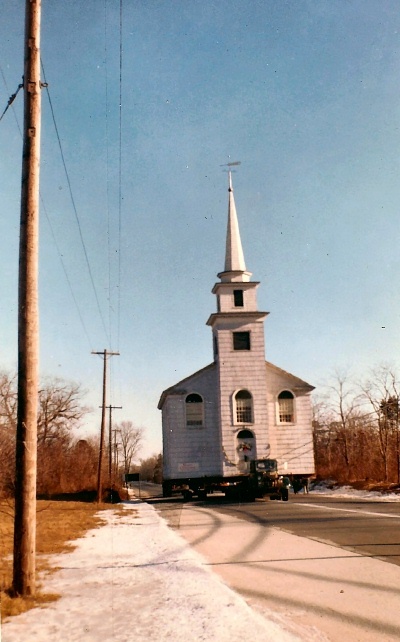 While this is a relatively slow week at Old South Haven Presbyterian Church, 50 years ago the church was very much on the move—quite literally. 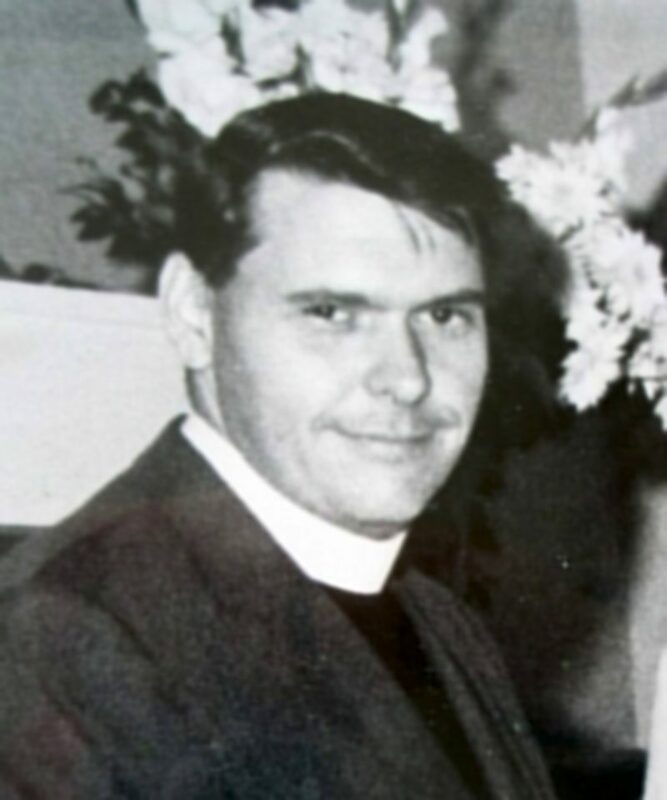 On December 29, 1960, under the leadership of the Rev. Charles Kellogg, the historic South Haven Church building was moved from its original location at the "goin' over" of the Carman's River at South Haven, to its present location in Brookhaven. As part of this move, the church also acquired and renovated the Post Carriage House (built about 1900) which became our Parish Hall, and built the "gallery" addition at the rear of the church. 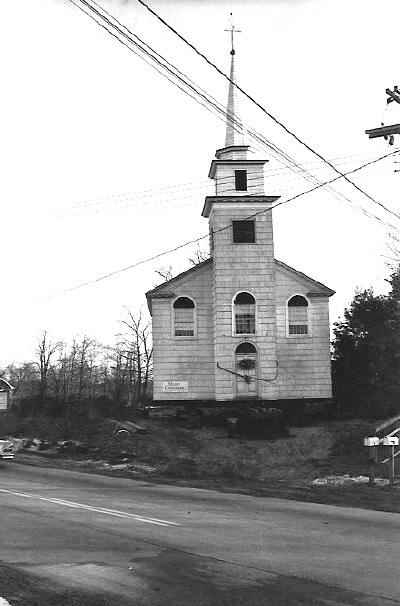 The church building original stood on the south side of Montauk highway, a few hundred feet west of the Carman's River. The old church grave yard is still located there. The church was moved by Davis Brothers Engineering, the same building movers who raised the Carriage House as part of its recent renovation. The route of travel was east on Montauk highway to Arthur avenue, to Beaver Dam road, to the present site. There it sat for several months while the new foundation was built and allowed to cure. The church was moved with the steeple and interior plaster intact. 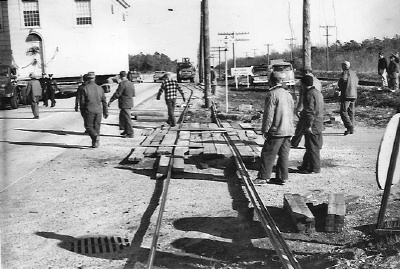 The move necessitated the cooperation of the then Patchogue Lighting Company, the then New York Telephone Company, Western Union, the Long Island Rail Road and state, county and town highway departments. 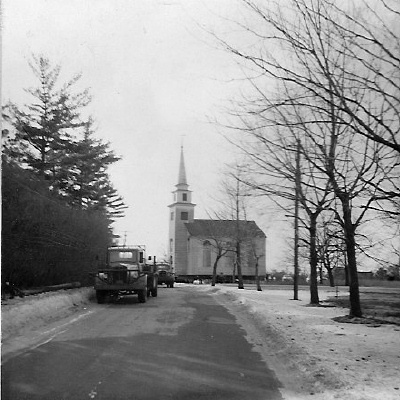 The utilities dropped their wires, perhaps as many as 150, and ramps were laid, to permit the church to roll over them. It was estimated that it took some 50 people to move the building the four miles. 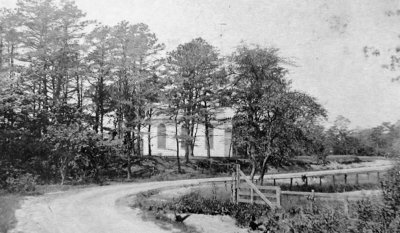 Earliest known picture of the church in South Haven, thought to be about 1900. Church ready to be moved. Photographs of the move courtesy of Catherine Kellogg. candles in our church windows and as luminaries lighting the front walk and, of course, lighting our individual candles from the Christ Candle at the close of the service. There will be an opportunity to give to the Christmas Joy Offering of our denomination or to our church’ local ministry. In a certain village in Mexico, many years ago, it was customary on Christmas Eve to take gifts to the church and place then before the Crèche. One evening there was a small boy standing outside the church door. How he wished he could enter the church and present a gift to Jesus, but he was poor. He had nothing to give. Last Sunday it was announced that Alan Steven had a heart attack the previous night and was in Brookhaven Hospital. Monday he was transferred to Winthrop Hospital in Mineola and there received three stints. He returned home on Tuesday. Darcy reports that both she and Alan will be at the Christmas Eve Service and serve as readers. With joy we celebrate. Three times during the year we receive a special offering: One Great Hour of Sharing; the Peace Offering; and the Christmas Joy Offering. For over seventy years, Presbyterians have given generously at Christmas to support the unmet needs of families who have devoted their lives to the mission of the Presbyterian Church USA. Today this Offering is shared equally by the Assistance Program of the Board of Pensions, which provides critical assistance to Presbyterian Church workers and their families, and, secondly, to Presbyterian-affiliated racial ethnic schools and colleges, which enable students to develop their gifts and find their calling. There will be special envelopes available in the pews this Sunday and on Christmas Eve. Sunday’s bulletin will also contain an insert on individuals who have been helped by this Offering. A thank you to the Deacons for preparing Christmas stockings filled with appropriate items. These will be distributed to residents at the Nursing Home. “ It’s beginning to look a lot like Christmas” The Christmas tree is now up and decorated in the sanctuary. Slowly other items are added to make this a festive season. Thank you to all who participated in this event last Sunday. After worship, Christmas tree will be set up and prepared for decoration. 1.Approved vacation time for Pastor Tom from Monday, January 31 toThursday, February 24. Pastor Tom will be traveling in Brazil and Peru. 5. Approved setting up Christmas Tree after Morning Worship on Sunday, December 5. Potluck supper Sunday evening, and then return to Sanctuary for decorating and singing. 6. Approved a joint Session/Deacon meeting for Monday, December 20. 8. Received report on the progress on Caithness projects: windows, roof, front door threshold. 9. Announced the next book reading will be Thornton Wilder’s novel “The Bridge of San Luis Rey” during the month of January. 11. Received Financial Secretary’s Third Quarter and Treasurer’s monthly reports. We are doing well! 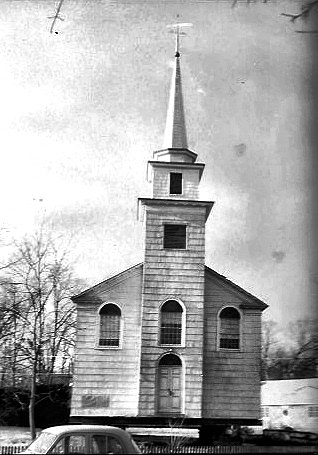 In 1827 there was a church erected in South Haven, L.I., in which there had never been a light nor an evening service, until last Christmas evening , when the children were given a Christmas tree. • Watch for your “Stewardship” letter this week. Included in it will be a pledge card for recording your 2012 giving commitments. Did you know that 91% of individual giving to the general program of the church is by those who make a pledge? Pastor Tom’s stewardship sermon “Entrusted to Us” may be heard online—see below. • Did you know that on our website are audio recordings of Pastor Tom’s sermons? —visit http://oldsouthhavenchurch.org/AudioLibrary/AudioCatalog.aspx. Also, at this site, are recordings of some of the choir’s anthems. • And on our home page at http://oldsouthhavenchurch.org/ may be found an up-to-date calendar of church activities. • Progress is being made on the projects under our grant from the Caithness Fund. Repair and painting of the windows is nearly done (SBP Contracting of Mastic Beach); and other work is underway—new roof shingles (Cee & Gee General Contracting of Center Moriches) and a repair of the steeple tower foundation (Steven Gould of Brookhaven). The Fall/Winter Old South Haven Presbyterian Church Newsletter is now available online. We can soon expect to see the beginning of work at the Church and Carriage House. Purchase orders have been issued by the Town of Brookhaven using Caithness Funds for reroofing the Church building and repairing the main the main church windows, and work should start within the next week. New storm windows will soon be in place for windows of both the Carriage House and Gallery using church maintenance funds. And we expect to see repairs to the steeple also start soon using proceeds from our insurance claim. We have not yet heard from the Town on the repairs planned for the steeple foundation using Caithness funds. to serve the GLBT community. He died in his sleep at age 36.
continues to course through the veins of the church body. The Peacemaking Offering will be received and dedicated. Pastor Tom will provide transportation. Adults $25; children 5 to 10, $12; under 5 free. speaks on his summer work project in New Orleans.